San Francisco was born in 1181 to a prosperous Italian merchant family. After a very brief career as a soldier Francis experienced a great conversion and dedicated his life to penance, poverty, and the passion of Christ. He founded the Order of Friars Minor, commonly known as the Franciscans, which spread throughout Europe. Francis was the first known saint to experience the stigmata, the signs of the wounds of Christ. He led a life of extreme privation all the while praising God in His wondrous creation. In New Mexico San Francisco was one of the patrons of the lay Brothers of Penitence. Many places in the state are named after San Francisco including the famous city of Santa Fe which was originally called the “royal city of the holy faith of St Francis”. The Santa Fe cathedral is named after San Francisco as was the first Franciscan mission at the native pueblo of Puaray. In sacred art San Francisco is shown in brown, grey, or blue robes tied with a knotted cord. He is sometimes surrounded by animals, especially birds. In his penitential aspect, San Francisco is shown praying in a cave before a crucifix with a skull at his feet or sometimes with his hands outstretched as he receives the stigmata. San Francisco is patron of all Franciscans, penitents, the poor, nature, and ecology. 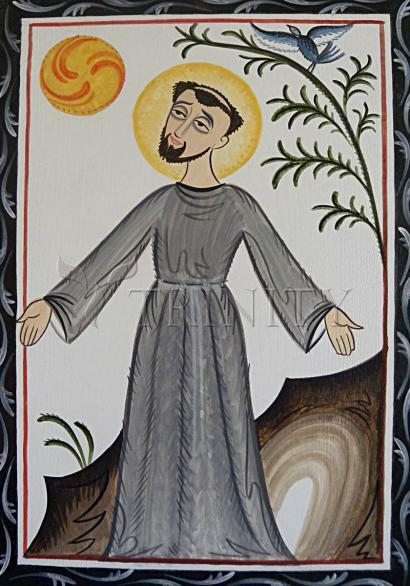 We know more of St. Francis than of any other medieval saint. Not only have we his own words, his Rule, Testament, letters, poems, and liturgical writings, but also the intimate accounts of several of his disciples, written down within twenty years after his death. These first biographies, by Brothers Thomas of Celano, Leo, Angelo, and Rufino, were soon revised and added to by other friars who wanted to call attention to one phase or another of Francis' work and teachings. From this great store of authentic material a clear picture of the man emerges. St. Francis is one saint whom both Catholics and non-Catholics have united in honoring. Certainly no other has so appealed to Protestants and even to non-Christians. And the appeal is timeless: Francis captured the imagination of his contemporaries as well as that of modern men by his unique simplicity and a pure grace of spirit. A classic collection of popular legends, the Little Flowers of St. Francis, first printed in 1476, contains charming and beautiful stories of Francis' love of the poor, of animals, of all nature. In action he was original, in speech picturesque and poetic, yet he was a man utterly inspired by faith in and devotion to the risen Christ. Francis was born in the stony hill-town of Assisi in Umbria, in the year 1181 or 1182. His father, Peter Bernadone, was a wealthy merchant. His mother, Pica, by some accounts was gently born and of Provencal blood. Much of Bernadone's trade was with France, and his son was born while he was absent in that country. Perhaps for this reason the child was called Francesco, "the French man," though his baptismal name was John. As a youth he was ardent in his amusements and seemed carried away by the mere joy of living, taking no interest at all in his father's business or in formal learning. Bernadone, proud to have his son finely dressed and associating with young noblemen, gave him plenty of money, which Francis spent carelessly. Though Francis was high-spirited, he was too fastidious to lead a dissolute life. It was the age of chivalry, and he was thrilled by the songs of the troubadours and the deeds of knights. At the age of twenty or thereabouts, during a petty war between the towns of Assisi and Perugia, he was taken prisoner. During a year of captivity he remained cheerful and kept up the spirits of his companions. Soon after his release he suffered a long illness. This he bore with patience. After his recovery Francis joined the troop of a knight of Assisi who was riding south to fight under Walter de Brienne for the Pope against the Germans. Having equipped himself with sumptuous apparel and fine armor, he fared forth. On the way he met a knight shabbily clad, and was so touched with compassion that he exchanged clothes with him. That night he dreamed he saw his father's house transformed into a castle, its walls hung with armor, all marked with the sign of the cross; and he heard a voice saying that the armor belonged to Francis and his soldiers. Confident now that he would win glory as a knight, he set out again, but on the first day fell ill. While lying helpless, a voice seemed to tell him to turn back, and "to serve the Master rather than the man." Francis obeyed.